The London & Birmingham Railway (L&BR) was London’s first main line and the largest civil engineering project yet attempted in the country, on a scale rarely matched before. The experience gained formed the basis of much of the general development of civil engineering in Britain and established the construction technology of the railway age. It also precipitated the railway mania of the 1840s. 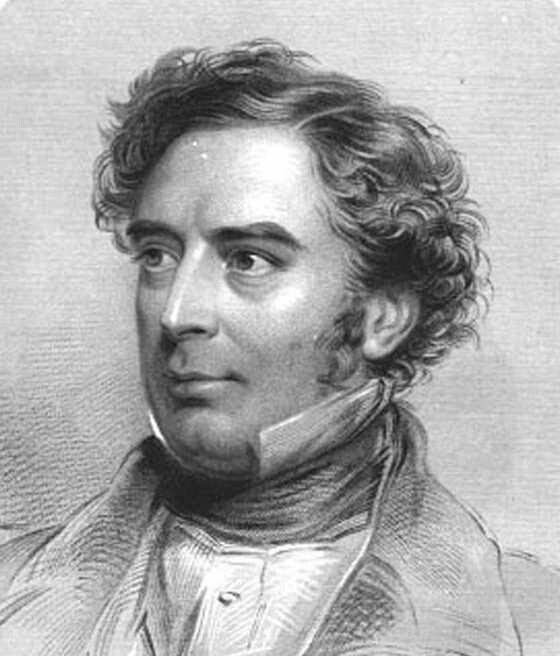 Robert Stephenson, son of George Stephenson, was appointed engineer-in-chief for the whole line in September 1833. He was not yet thirty. He lived from 1836 to 1842 in a house then called 5 Devonshire Place, on the west side of Haverstock Hill, at the corner of Belsize Grove. His wife, Frances, died here and is buried in Hampstead churchyard. The route of the line at the London end was dictated by the desire to reach the docks. Plans for the London terminus of the railway at Maiden Lane, near Kings Cross, had been rejected by Parliament and Robert Stephenson, ordered to make economy cuts, proposed a terminus in Camden Town at a depot by the side of the Regent’s Canal, adjacent to the Hampstead Road. At Camden Station some rail freight destined for waterside locations, including the Docks, could be transferred to the Canal, while rail passengers and other freight would be discharged onto the road system at Hampstead Road (now Chalk Farm Road). 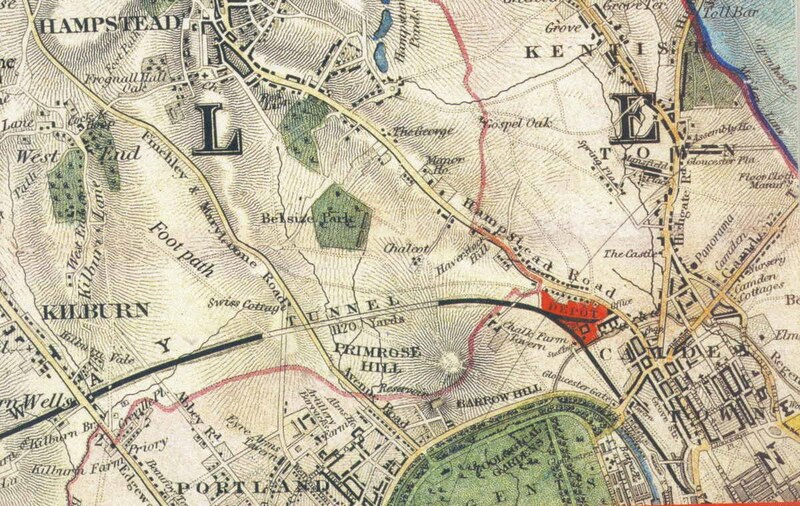 Forced by high ground to approach London from the west rather than the northwest, the railway made its way around the edge of the built up area, heading slightly north of east, and passed between the southern flank of Hampstead Heath and Primrose Hill. The ground to the south of Primrose Hill was blocked by Regent’s Park and Portland Town. Gradients were kept down to 1 in 587 by means of nearly three miles of cutting and the 1120 yard (1024 metre) Primrose Hill Tunnel. In late 1834 the L&BR company applied for an extension from Camden Town to allow passengers to reach Euston. The extension to Euston Grove, beside the New Road, was authorised on 3 July 1835 under the amending Act. The Regent’s Canal had to be crossed at a height that allowed boats to pass below; the ground at Camden Depot therefore had to be raised, while that at Hampstead Road, close to Mornington Crescent, and six other road crossings, had to be lowered for rail tracks to pass under the roadways. The deep cutting with its handsome stone and iron bridges had massive curved retaining walls formed from about 16 million bricks. The original plan was for Euston to serve both the L&BR, London’s first main line, and the Great Western Railway (GWR). However, as a result of Isambard Brunel’s insistence on a 7 ft (2.1 m) gauge for the GWR, and other disagreements between the rail companies, the west side pair of lines was not used by the GWR. A stationary winding engine house was built by Robert Stephenson to pull trains up the incline from Euston to Camden Town, known as Camden Bank or Camden Incline, with a 4080 yard (3730 metre) long endless rope. Both the winding engines and the 19 ft (6 m) deep cutting to Euston responded to the concerns of influential local residents in regard to the noise and smoke from locomotives toiling up the Incline. The winding engine house formed a large vaulted underground structure, located under the main line just north of Regent’s Canal Bridge. Motive power was provided by two steam engines of 60 hp. Its two prominent chimneys became a tourist attraction. They were 133 ft (40 m) high, tapering from 12 ft (3.7 m) diameter at the base to 6 ft (1.8 m) at the top. Later railways in the Camden area were to avoid the steep gradient imposed by the Regent's Canal either by going under it, as at Kings Cross, or by raising the rail terminus on arches, as at St. Pancras. The first sod for the L&BR was cut at Chalk Farm on 1 June 1834. Difficult ground conditions on the Primrose Hill contract, including the tunnel and deep approach cutting, bankrupted the contractor. The work had to be taken over by the company using direct labour. Maudslay, Sons & Field of Lambeth supplied 12 Bury-type 0-4-0 locomotives for the L&BR as well as the winding engines, delivery of which was delayed by repairs to the Regent’s Canal. A variety of Stephenson and other locomotives worked trains up the Incline until the winding engines were commissioned. The Euston to Boxmoor section opened on 20 July 1837, and the 32 mile (52 km) line from Euston to Tring (and another section south from Birmingham) was opened in October 1837. 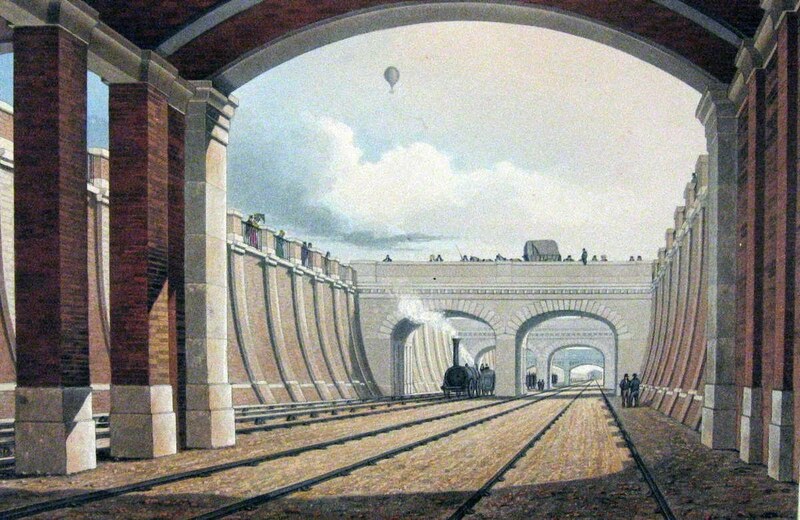 The through line from London to Birmingham opened for public service on 17 September 1838. Initially passengers were unable to alight at Camden Station as the access road to the Hampstead Road was considered unsuitable, and a passenger station was created at Chalk Farm Bridge (now Regent’s Park Road Bridge). 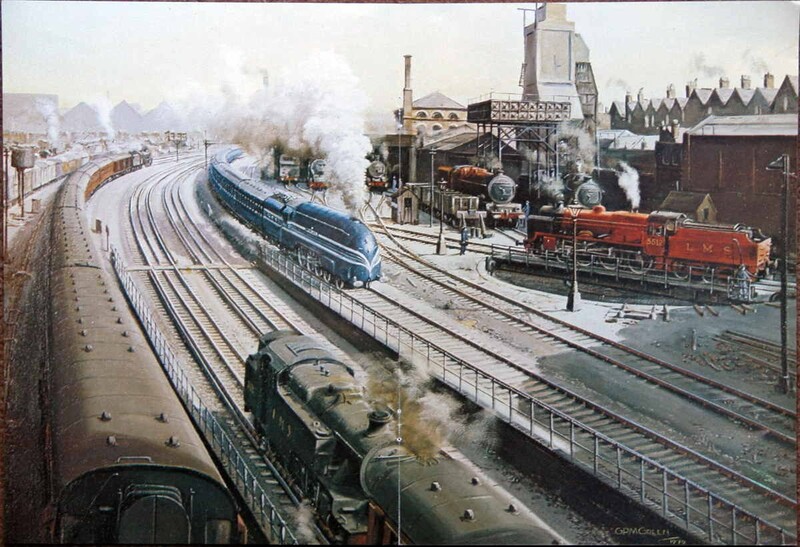 In 1837 there were three trains a day going north from Euston pulled by small and slow locomotives. Only passengers went as far south as Euston. Camden handled all freight, which was transferred to road for distribution around London, or to the Regent’s Canal for transport to and from London docks. First class passengers travelled in comfortable covered coaches but third class wagons were open, without windows, curtains or cushions on the seats. Both forms can be seen in the picture, showing Euston Station in 1837. Third class was stopped in October 1837 to be resumed three years later with third class trains and closed carriages. At Camden the train from Euston arrived at the Iron Bridge that carried the railway over the Regent’s Canal and shortly afterwards the ‘messenger’, which attached the first carriage to the endless rope, was cast off before reaching the winding engines below. Carriages were then allowed to run along the line until they met and were harnessed to the locomotive engine by which they were pulled to Birmingham. From the stationary engine house to Chalk Farm Lane Bridge the gradient reversed from the climb up the Incline to a slight fall. This was engineered so as to check the speed of a train coming into London, and to give an impetus to one leaving London. Trains from Birmingham would stop at Camden for tickets to be collected and for the locomotives to be detached from the front of the train and shunted to the rear to give the train an impetus towards Camden Incline. The train, now controlled by a brakeman or ‘bankrider’, travelled under gravity down the slope to Euston Station at a maximum speed of 10 mph. The endless rope can be seen between the rails of the eastern pair of rail tracks in the two pictures of Camden Incline. After a number of trials, it was found that newer and more powerful locomotives could manage the Camden Incline, often with a second locomotive at the rear of the heavier trains. This saved time and operating costs, and the stationary engines were abandoned in April 1844. The underground vaults built by Robert Stephenson to house the stationary winding engines have survived extremely well and are structures on a truly majestic scale. In 1846 the London & Birmingham Railway (L&BR) amalgamated with several other companies to become the London & North Western Railway (LNWR), the largest of the Victorian era companies. The rail freight connection to London docks was not made until the completion of the East and West India Docks and Birmingham Junction Railway in 1851. 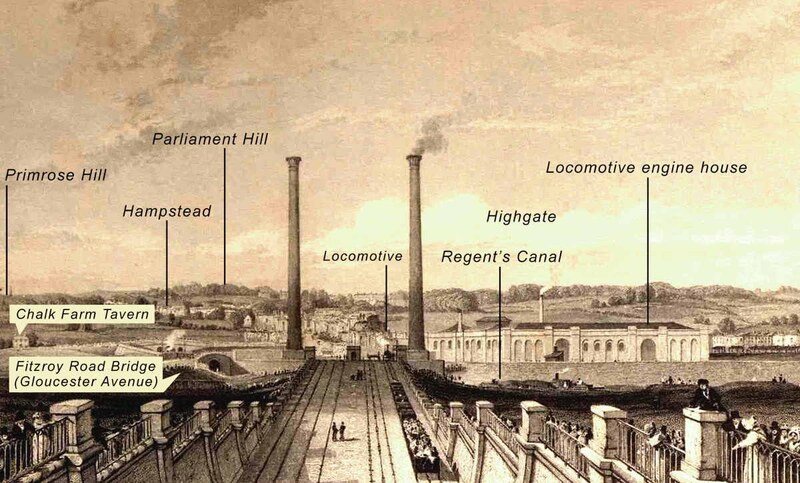 The name was changed to North London Railway (NLR) in 1853. This line proved very successful as a passenger line for city workers commuting from the new estates. With the through line from Camden Town, goods could be moved directly to and from the London docks, and the railway was a real rival to the Regent’s Canal at last. The LNWR was a ‘main line’ railway and local traffic was largely left to the NLR. Hampstead Road station was opened in 1851. The station was re-sited four years later, renamed Chalk Farm in 1862 and rebuilt in 1871. Chalk Farm Station had platforms on both the LNWR and NLR lines with a footbridge link between the two after 1872. The four-track LNWR line out of Euston was widened between 1900 and 1906, requiring the demolition of one side of Park Village East. Until the 20th century LNWR proper had no suburban services to speak of, except those associated with the NLR. After 1907, traffic was lost to Chalk Farm tube station, but the LNWR platforms lingered mainly for ticket collection purposes. Ticket collecting from platforms declined, however, and this, together with the need for space for the new system of sub-surface tracks, led to the demolition of the LNWR Chalk Farm station in 1915. No traces of the old LNWR platforms remain today. The North London Railway became part of the LNWR in 1922. The next stage of major expansion was essentially for suburban services. 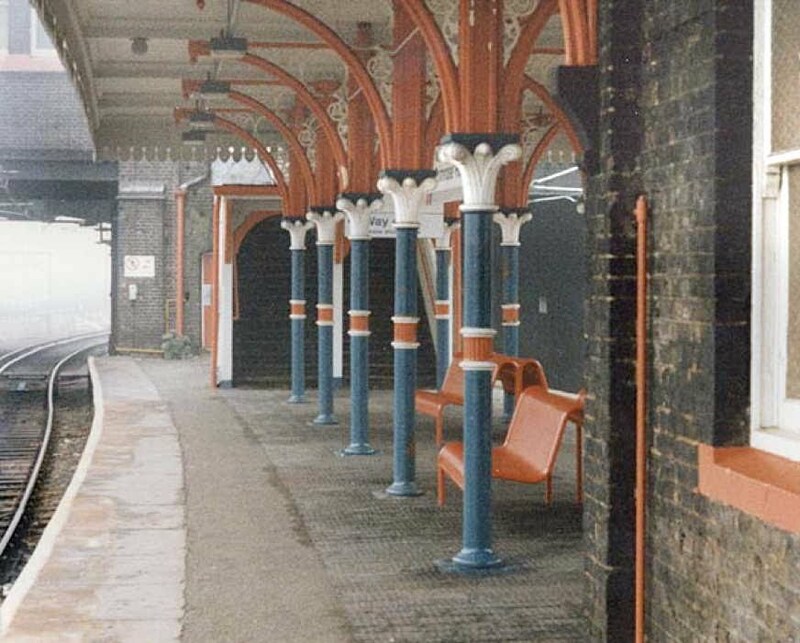 It was based on the broad concept of an electrified system embracing all the North London lines west of Broad Street, an electrified line to Watford, and the extension of the Hampstead services by electric trains to Kew Bridge. The main lines from Euston to the North were already far too crowded to permit an intense electric service being superimposed on them. The decision was taken to build a “New Line” on which the suburban electric services would be almost entirely independent of the main lines, designed for four-rail DC electric trains. At Willesden Junction and eastwards to Chalk Farm widening could be done most conveniently on the up (into London) side of the line. The New Line was opened in stages from 1912. Various stages within Camden were completed over 1915-1917, including two single track tube-type tunnels just north of the original Primrose Hill Tunnel, but the entire project was held up pending the complete track-remodelling scheme at Chalk Farm, which created an elaborate system of burrowing junctions. On 10 July 1922, Chalk Farm station, long closed to passenger traffic, was reopened, although with platforms only on the line to Broad Street. The lines from Euston, the exit from Camden goods yard, and the newly electrified link from Camden Town all led to the new non-conflicting junctions controlled by Camden No. 2 box. Here they were sorted out to enter the old fast (southern) and slow (northern) Primrose Hill Tunnels and new twin electrified bores. The new bores at Primrose Hill Tunnel, and new tracks from there to Queen’s Park, were the final portion of the new line to be opened. The LNWR became part of the London Midland and Scottish Railway (LMS) under the “Grouping” of 1923. After nationalisation in 1948, the London Midland Region of British Railways administered Camden Goods Depot. 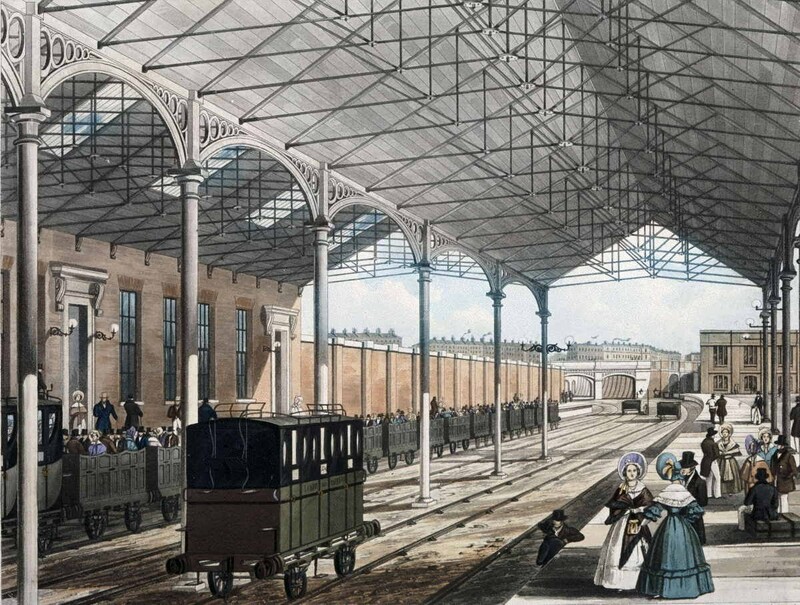 After the opening of a new shed at Willesden for freight locomotives in 1873, the remaining locomotive shed at Camden Depot was used almost exclusively by large express passenger locomotives. It thus became a mecca for train buffs. Steam lasted until 1962, to be replaced by diesel, but the diesels did not stay long and the Passenger Locomotive Shed (then known as Camden Motive Power Depot) was closed completely on 3 January 1966. Today carriage sidings occupy much of its site. The goods depot closed around 1980. In 1950 Chalk Farm station became Primrose Hill station and the street building was reconstructed. Primrose Hill station closed on 22 September 1992. The island platform with its 1871 buildings remained until December 2008 when it was demolished controversially by Network Rail.